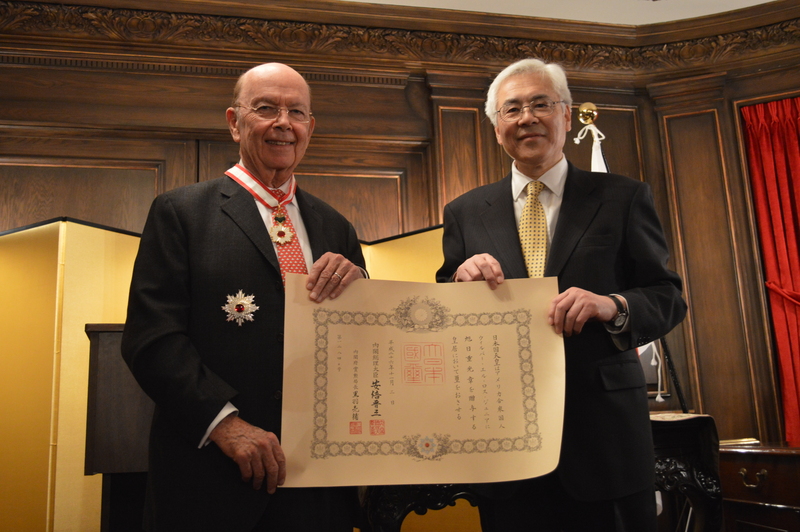 Wilbur L. Ross Jr. received The Order of the Rising Sun, Gold and Silver Star at a ceremony at Japanese Ambassador Sumio Kusaka’s residence on February 2. 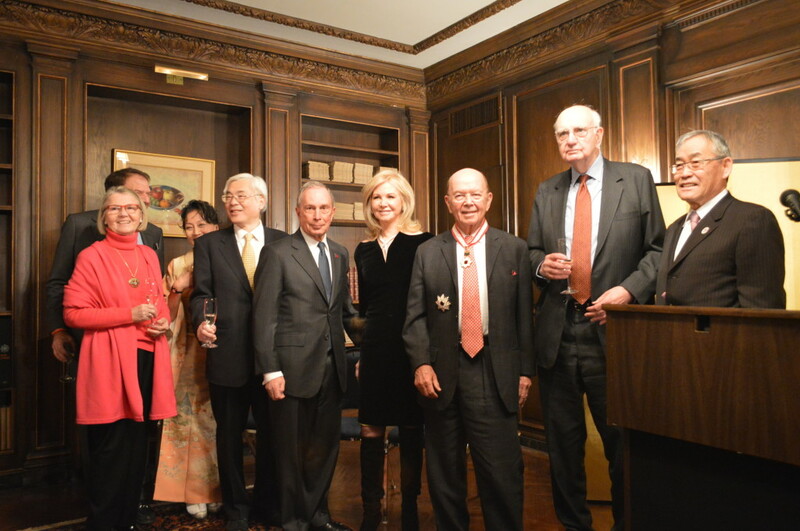 The Chairman and CEO of WL Ross & Co. LLC as well as the Chairman of Japan Society, Ross was honored with the Japanese government’s Autumn 2014 Decoration for his years of service in advancing cultural exchange and strengthening the bonds between Japan and the United States. 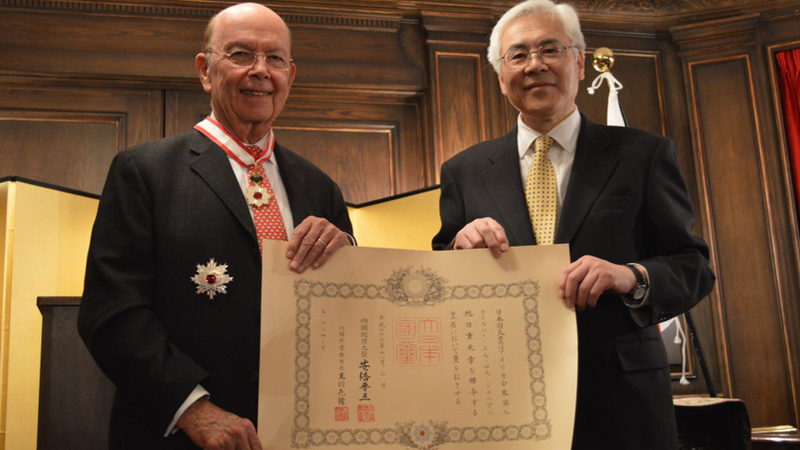 Wilbur L. Ross Jr. with Ambassador Sumio Kusaka. Photo courtesy of the Consulate-General of Japan in New York. Ross has served on Japan Society’s Board of Directors since 2005, becoming the non-profit’s chairman in 2010. An investor whose private equity firm specializes in restructurings, reorganizations, turnarounds and buyouts, Ross is credited with transforming Japan Society by improving the quality of the organization’s programs, lectures, and exhibitions, resulting in increased revenues through memberships and sponsor donations. Ross’s company has been investing in Japan since 1997, promoting the strengthening and enhancement of the Japanese economy. In 2000 WL Ross took over Kofuku Bank in Osaka after it collapsed due to nonperforming loans and successfully merged it with the Kansai affiliate of Sumitomo Mitsui Bank. Following the devastating earthquake/tsunami/nuclear meltdown in Tohoku on March 11, 2011, Ross encouraged investors from both Japan and the US to remain confident that Japan’s economy would recover. He helped establish a relief fund that raised $14 million for the areas affected by the 3.11 disaster. We congratulate Mr. Ross on this prestigious honor, and we thank him for his continued efforts in US-Japan relations. Photo courtesy of the Consulate-General of Japan in New York.